Nineteen months after Woodford Leisure Centre closed its doors, the extension, including new 25m swimming pool and learner pool, is almost complete and contractors Hobson & Porter are preparing to pack up and move out. The multi-million pound refurbishment and extension includes new sauna and steam facilities, much improved changing facilities, a café located at the new entrance and enhanced parking facilities. The installation of new environmental technologies including a thermal glazing system roof will also look to reduce longer term operating costs. The facility will also include a revamped gym and immersive studio. Since its closure in September 2016, local contractor Hobson & Porter has undertaken multi-disciplinary works to refurbish the existing leisure centre building (including replacing the roof), create a new front elevation to the building and an extension to house a new reception area, a 25-metre, six-lane swimming pool and a 10-metre beginners’ pool. An early challenge was presented by the poor, clay-like ground conditions. This was overcome by inserting 13m-long sheet piling on a temporary basis. The team was able to then begin drainage and foundation works, alongside construction of the pool shells. “It’s fantastic to see the majority of the building work complete at Woodford and I am delighted with the results that I’m sure will prove incredibly popular with residents. “Woodford is an iconic building in Hull that has been enjoyed by local residents for many years, so we are very proud to be working on its regeneration. When it reopens the centre will provide modern, first-class facilities to the area for families and people of all ages to enjoy. Once Hobson & Porter move off site, Hull Culture and Leisure staff will arrive back to embark upon training in the new systems and technology, ready for opening to the public in May. 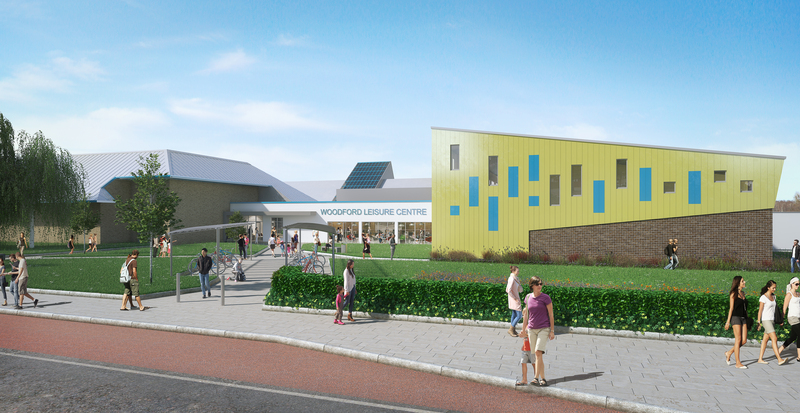 The extension of Woodford Leisure Centre on Holderness Road was given approval by Hull City Council Cabinet in February 2015 as part of the Visitor Destination Phase 1: 2017 Priority Programme. Works are underway to progress the new six-lane twenty five metre pool and ten metre beginners pool as well as improved changing facilities, following demolition of the existing entrance area. Additional plans also include new sauna and steam facilities, a café located on the ground floor at the new entrance. The installation of new environmental technologies will also look to reduce longer term operating costs. The car parking area will be relocated and provide additional spaces. During this closure alternative leisure and swimming facilities can be found at East Hull Baths, Beverley Road Baths and Ennerdale Leisure centre.